Yet organisers of the latest campaign - "A Million Voices Against Corruption - Chen Must Go" - have been trying to keep their distance from the mainstream political parties, saying that offers of help from legislators have been turned down. "We don't want any partisan support. We try to keep this as pure as possible, as a movement of the people," said Emile Sheng, professor of politics at Soochow University, who has joined the protest camp as a media spokesman. "For me, this is a social movement to rebuild the moral standards of Taiwan politics," he said. "Moral standards are not something Taiwan politicians really care about. "I think by putting people's attention on anti-corruption, it's going to send a message directly not only to the president, but also to every politician in the future in Taiwan. To let them know that we as a people really care about moral standards and want politics to be conducted in a civil way." Here is Shih Ming-te flanked by Blue leaders KMT Chairman Ma Ying-jeou on his left, and PFP Chairman James Soong on his right. Non-partisan? 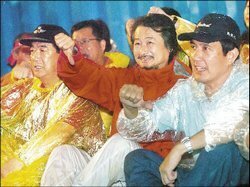 There's Shih seated with two pro-Blue leaders. Shih himself has been cooperating with the Blues for the last five or six years. Anti-corruption? Soong was just convicted in a tax evasion case, and was fingered in French magazine as the bagman for a $400 million payoff. Morality? Sitting there with two willing servants of the authoritarian regime? This whole thing is a drama of pro-Blue political hackery. I have this dream that some day the media services are going to send people here who both know the island and are willing to dig. I can name two dozen bloggers who could come up with a better piece than that. UPDATE: Quite a lot of us have complained about the BBC article, both local expats and locals. Maddog discusses his response here. Meanwhile, as of Tuesday the 12th, there are still no comments up. "You piece on the weekend protests in Taipei unfortunately takes Prof. Sheng's words at face value, that this is a nonpartisan effort to restore morality to Taiwanese politics. This, however, could not be farther from the truth. Both chairmen of the opposition Kuomintang and People's First Party not only showed up at Friday's event, but posed for photos with Mr. Shih, who seems quite tickled at the partisan company. These protests are nothing more than a partisan attack on the elected government of Taiwan dressed up in populist pageantry. It's a shame your correspondent didn't bother interviewing someone who recognizes this fact." I just left pretty much the same comment there, in longer format. It just. pisses. me. off. that the foreign media are soooooooo incompetent, and on such important topics. Michael I just ran into your blog haphazardly. I lived in Taiwan for 7 years. Your pictures and stories are absolutely amazing. We are watching the political issues here from the states on television. It's quite interesting... I understand your comment about the desire for morality. However... remember that when Chen got elected there was a bit of that attitude in the air because the KMT did some things that the public did not approve of (bribes and stuff). So, did it get any better with Chen? Now they are here protesting... will it ever change? Sure, they ran on an anti-black gold campaign. That's why they made themselves vulnerable to charges of corruption. They never made any allowance for the inevitable corruption that would take place in their own administration. Stupid. I think Taiwan will clean up, but it will take two generations. Maybe my son will see it, but I don't think I will. But a necessary first step is establishing rule of law and investigation, indictment, conviction, and imprisonment of those involved in corruption. The anti-Chen campaign is the opposite of the rule of law, and represents a retrograde step. Michael, I always read your blog and a few others because it gives much more informed commentary than either the Taiwanese or foreign media. The journalists who write these pieces would do very well to start reading your blog!!! LOL. Thanks. After I commit mayhem among the breakable objects in my living room, I'll send her a rational missive detailing the problems with her piece. Then I'll go break a few more objects. It's no coincidence that the first chapter of my book on Taiwan is going to be about the foreign media. "..and now for the latest developments in Taiwan we go to our East Asia correspondent reporting from Hong Kong." LOL. The sad part is she is actually based in Taipei. It's too bad I left that bottle of tequila at the neighbor's. I could use a general purpose anaesthetic about now. I never thought of that, you are right... no wonder it did make them vulnerable to scrutiny. You also touched on a good point about taking 2 generations to get cleaned up. I've always thought that as well, it's part of democratic growth. Aha, you also hit the nail on the head... if it's just a slap on the wrist... who cares anyway? I asked a Taiwanese today to sum this up. Here is what I get. "Chen is not being impeached, and if nothing is proven, then these people are just wasting their time out in the street". Perhaps their impeachment process leaves a lot to be desired. Don't know. PS I want to read your book when it comes out, post it up here. T., I deleted your comment. The corner pic is of the National Palace Museum, seen from the balcony. It just. pisses. me. off. that the foreign media are soooooooo incompetent, and on such important topics. The empirical evidence tells us again and again that their "mistakes" usually favor the pan-blues. This makes me tend to think it's all on purpose. Note how neither your comment nor Jason's nor mine has appeared below that article. In fact, not a single comment has appeared there so far. I've just posted about this on my blog too. We're only able to watch CTI news channel over here in NZ and the protest coverage has been on for the past three days. It is one of the more ridiculously biased pieces of trashed I've ever seen. I ran across a satellite broadcast of TVBS-N yesterday, which was apparently running video of the protests 24/7. If there was any doubt about where the station's loyalties lie, every ten minutes or so they'd run a video clip of protesters in the rain complete with somber music and the title "人民的聲音". Being abroad at the moment I have thankfully been isolated from most of the craziness. Just wrote to say that I, too, wrote a response (below) to the BBC article "Protests against Chen gain ground" by Caroline Gluck, and did it only hours after the article was posted on the net. I personally do not think it is being overly suspicious to think that the BBC is engaging in self-censorship on issues related to Taiwan. The pressure felt by the BBC might be direct or indirect. What do y'all think? Don't you suppose that there are officers in the London embassy of the PRC charged with the duty of monitoring and responding to details of BBC news coverage? And who knows what Ms. Gluck's editor is cutting. The BBC wants to expand its presence and visibility in China, and may be doing what Yahoo and Goole have already done. The organizers and supporters of this movement represent the portion of Taiwanese people who have yet to gain a mature understanding of how a stable democracy must be maintained. Although the leader of this movement has tried to make it appear non-partisan, it is clear that these are the same people (KMT supporters and their allies) who have been protesting against President Chen ever since the DPP first became the ruling party and broke the KMT's decades-long monopoly on power. These are the same people who were protested for weeks after the 2004 election, demanding that Chen step down for supposedly arranging the assassination attempt which occurred the day before his 2004 re-election. The glaring question that anyone familiar with recent Taiwan political history will want answered is how these people can expect their anti-corruption slogans to be taken seriously if they remain content to overlook the on-going history of corruption among current and former KMT members. Even they must be aware of the fact that corruption in the KMT goes much deeper and involves many more people and much more money than any wrong-doing the DPP has had time to become guilty of. The protesters think they are part of a noble people-power struggle to depose a corrupt dictatorship. How ironic that this week's anti-Chen protesters represent the same forces who resisted the transition to democracy in the first place. Well said, Michael, spot on!! just want to ask your permission if i can post this article on the other site (http://www.socialforce.tw). this BBC's piece is so unprofessional and full of bias. moreover, i've just found out the BBC site categorizes Taiwan as a province of China. It is totally unacceptable. shall make another complaint to them regarding this con. yes, post it wherever you like! My guess is that the BBC site doesn't accept what they may see as soapbox rants. Also, length may be a consideration. So be smart about how you post. Keep comments short and sweet, and try not to foam at the mouth. Might help. Maybe, but not all the comments put in were soapbox rants. And if you read the comments on the editor's blog, there are some soapbox rants there. So I think the first reason might be wrong, although length is probably a factor. Maddog tells me he got a reply back on the comments issue. Maybe he'll post it. I got a call from the BBC today, as I was riding the bus back to Taipei after work. The editor in charge of "have your say" wanted to get a statement from me regarding a comment I had sent after reading last week's article by Ms. Gluck. Why Does Everyone Want to Be a Politician? Congrats to Wandering to Tamshui! Washington Times Editor to Change? Group Political Blog Up and Running: Have a Look!